Are you a quilter or do you know a quilter? Is there a quilting circle that meets in your neighborhood, local craft store or place of worship? Operation: Quiet Comfort needs quilters to assemble Four Freedoms Gratitude Quilts from kits. The kit includes everything you need for the front of the quilt and the dedication block for the back. Quilters are asked to provide the batting or flannel for the inside and the backing material. After resolving some production issues, OQC now has dozens of kits ready and waiting to be put together; we just need the people to do it. What exactly is a Four Freedoms Gratitude Quilt (FFGQ)? A Four Freedoms Gratitude Quilt is created from denim squares cut from our well-loved blue jeans and signed with heart-felt written messages of thanks, appreciation and encouragement by groups and individuals from all across America. The Four Freedoms Gratitude Quilt became our (forgive the pun) “signature” item to send to injured service members receiving medical care abroad. It is a symbol of the love and respect that we have for our troops. The Four Freedoms Gratitude Quilt pattern was designed by OQC founder, Lori Pate. She was inspired by President Franklin D. Roosevelt’s address to Congress on January 6, 1941, where he cited the “Four Freedoms”: Freedom of Speech, Freedom to Worship, Freedom From Want, and Freedom From Fear. you may know or a local quilting circle. 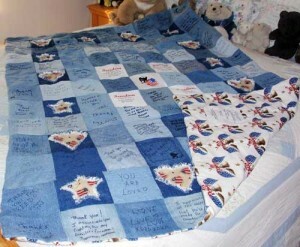 Let them know that it doesn’t need to be a long term commitment; even if the people you contact can do one quilt, it will make a difference for our wounded heroes. To request a quilt kit, just send an email to quilts@operationquietcomfort.com.